Emotional intelligence (EI) is the ability to identify, process, and handle the emotions of oneself and others. Having a high EI correlates with good outcomes at school and, later, in the workplace. Luckily, EI is something that can be worked on and improved over time. Here are some ways you can help your child raise his or her EI. The first step toward helping your child understand and handle feelings is to work on how you handle your own. Take a look at this article: “How to Improve Your Emotional Intelligence” to learn more. 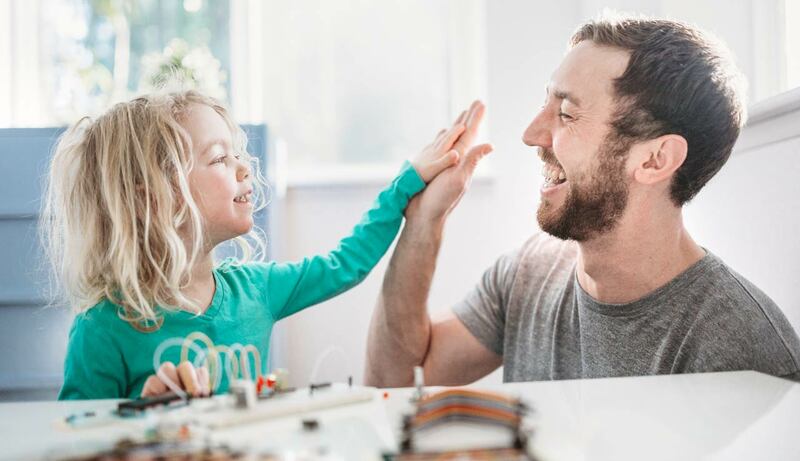 Parenting comes with its own huge set of emotions, so learning how you tend to react to your feelings, what triggers them, and how you can use them positively can go a long way toward helping your child do the same. Help your child recognize and name his or her emotions by learning to identify them yourself. That means lots of observation and understanding on your part. When you can recognize your child’s feelings early, he or she doesn’t have to engage in over-the-top version of them to be seen and heard. When you show judgment about your child’s feelings, it can trigger guilt and shame. Instead, it’s essential that kids learn all emotions are acceptable and healthy, and having feelings of any kind doesn’t make them less loved or cherished by you. When a child exhibits an emotion, especially if it’s considered to be a negative one like anger, sadness, or impatience, many parents feel uncomfortable or inconvenienced. Work on your own mindset with regards to emotions. Look at them as great opportunities to teach your child about his or her feelings and how to manage them. Don’t ignore or push aside your child’s feelings or their expression. When he or she is showing emotion, focus your attention on your child and acknowledge that you see and understand that feeling. Don’t make a judgment or ask your child to change the feeling. That gives the message that feelings should be suppressed and can lower emotional intelligence and result in problems over time. Once you’ve listened and have an idea of the emotion your child is feeling, help him or her label it. “It sounds to me like you’re feeling mad because Hank snatched your toy. Is that right?” Labeling feelings without judging them is the first step in properly processing and reacting to them, for kids and adults alike. When you help your child learn to label feelings, you’re validating those emotions and helping your child down the path of dealing with them well. You can also help your child pause and pay attention to what his or her body is feeling like when certain emotions are present. Ask what his or her stomach feels like, is there heart-pounding, do they have sweaty palms, etc. Learning the early signals that our bodies give us when we are just starting to feel an emotion can help us identify and process them more quickly and efficiently before they lead to negative behavior. One super important premise of emotional intelligence is the idea that all feelings are valid and acceptable but certain behavioral responses to them are not. Kids must be taught, through the setting of limits, that hitting, yelling, calling names, and other negative social behaviors aren’t good ways to express or handle feelings. You will need to help your child learn appropriate ways of handling feelings. For example, if they become angry, you can teach them to take deep breaths and count to ten before interacting with the person they’re mad at. It really helps if you have your child help come up with ways to handle their own feelings too. You might wish to practice this when the child is calm and happy. Role play different behaviors for when they’re needed. As your child grows, work on helping him or her learn to watch for and identify emotions in others. You can start by doing this with books and shows. Ask your child what he or she thinks a character is feeling and why. The more someone can watch for, identify, empathize with, and handle the feelings of others, the more successful he or she will be in both their personal and professional lives.